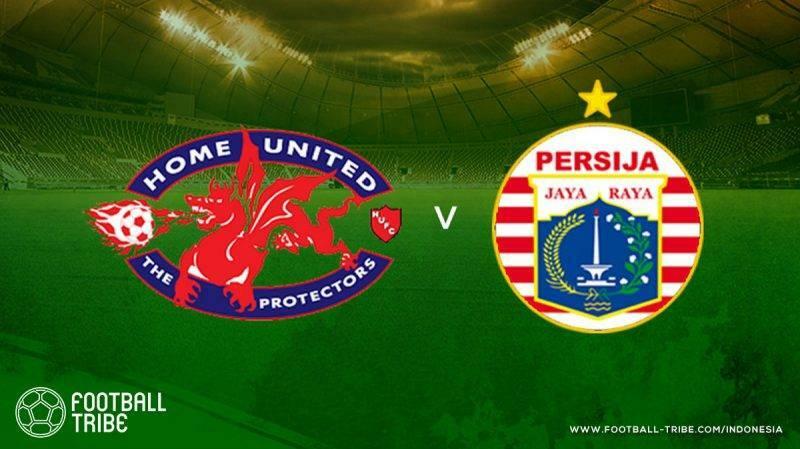 Indonesian champions Persija Jakarta send Home United home after winning 1-3 at the Jalan Besar stadium in the first qualifying round of the AFC Champions League Preliminary Round 1. Macan Kemayoran deployed a high pressing formation since the kick-off, putting The Protectors back on the defensive, while more than as hundreds of Jakmania supporters yelling around the artificial pitch, which the match look like a home game for Persija Jakarta. Ivan Kolev’s strategy was successful after only ten minutes as Ho Wai Loon scored an own-goal after he miss-anticipated Fitra Ridwan’s free-kick and sent a back header into his own net. Ten minutes later Home United were revived, as Korean starlet, Song Ui-Young, make the score level minutes before half-time. In the opening minutes of the second half, Kolev looked disappointed with his midfield. Persija’s lost boy, Tony Sucipto, who recently arrived from Persib Bandung, came on from the bench to replace Sandi Sute. Australian midfielder, Isaka Cernak, made an attempt for the home side but Andritany was able to save his header. Three minutes later, on-loan striker from Madura United, Beto Goncalves, scored a second for the away side, capitalizing on Riko Simanjuntak’s assist from the right side with a powerful header, in a goal similar to the one they scored for the national team in the 2018 AFF Cup against Timor-Leste. Persija Jakarta looked confident after Beto’s goal as Yan Pieter Nasadit and Septinus Alua came in to strengthen the midfield area. They waited for the ball and arrange a counter-attack scheme rather holding on to possession. While the away side were looking to hold on to their lead, Home United brought on Hafiz Nor and Iqram Rafiq from the bench to help find another goal. However, the counter-attack scheme was successful. Once again Riko Simanjuntak delivered in a perfect ball, this time from the left side, making a perfect through pass to Marko Simic who easily scored Macan Kemayoran’s third goal to kill the game off in the 83rd minute. After the final whistle, Persija success means they have succeeded in taking revenge, healing the wound that Home United made in the Jakarta on the last AFC Cup meeting, when they won by the same scoreline. Persija Jakarta now go through Preliminary Round 2 and meet the Australian side, Newcastle Jets in McDonald Jones stadium next Tuesday. Meanwhile, The Protectors have been dumped into the AFC Cup group stage and will be facing another Indonesian side, the 2018 Liga 1 runner-up PSM Makassar. Another SEA clash between Ceres-Negros of Philippines against Burmese club Yangon United also took place in Preliminary Round 1. Playing in Panaad Stadium in Bacolod, Philippines, the Busmen left behind after Vinicius Miller scored a goal in the 29th minute. Stephan Schroeck managed to tie the game right before half-time but Kaung Htet Soe’s goal in the 59th minute sent the Myanmar based club on to Preliminary Round 2, while Ceres will await their opponents in the upcoming AFC Cup group stage. The Filipino side will either face Persija Jakarta (if they lose against Newcastle United), or Bhayangkara FC, as the third-placed team in 2018 Liga 1, waiting to replace the Macan Kemayoran if they can go through the AFC Champions League group stage. More SEA club clashes will happen in Preliminary Round 2, not only for Persija who will meet Newcastle United but also Yangon United, who will meet Thai FA Cup winners Chiangrai United. Another Thai club, Bangkok United, will meet Vietnamese champions, Hanoi FC while the one and only Malaysian side from the preliminary round, Perak FA, will be hosting Kitchee SC of Hong Kong.